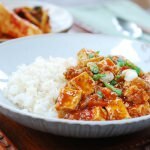 Dubu jorim is a Korean braised tofu dish that’s enormously popular as a side dish. With this simple recipe, you can easily turn your tofu into a flavorful side dish. 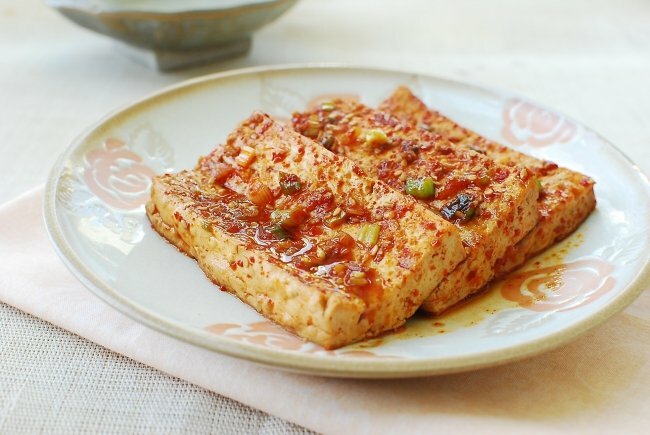 Dubu jorim is a Korean braised tofu dish that’s enormously popular as a side dish. Growing up as a child in Korea, this dish was one of the regulars in my home-packed school lunches (dosirak/bento) which usually consisted of rice and a few side dishes. 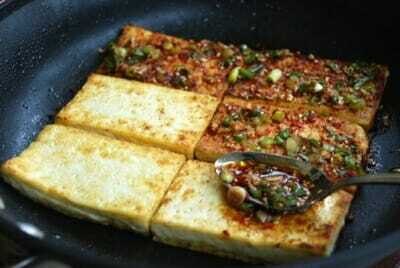 Tofu (dubu) is a staple in Korea as it is in several other Asian countries. 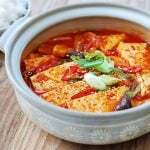 You can find many Korean dishes that are made with tofu as a main ingredient like dubu jjigae (stew), sundubu jjigae, dubu with stir-fried kimchi, and dubu jorim to name a few. 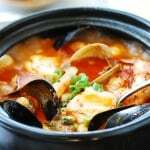 It’s also commonly used to complement other dishes like kimchi jjigae, bukeo guk (dried pollack soup) and mandu (dumplings). 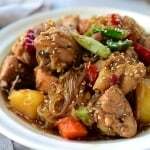 To make this dish, the sliced tofu is pan-fried and then braised in a soy sauce-based sauce. With this simple recipe, you can transform the tofu into a flavorful side dish. The gochugaru (Korean red chili pepper flakes) adds a little spicy kick. Add more if you like more heat. It’s delicious, warm or cold. You’ll find that the tofu tastes even better the next day. You may also like my spicy braised tofu. 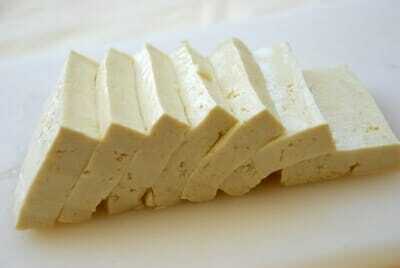 Cut the tofu block into 1/2-inch thick rectangular pieces. Pat dry with a paper towel. 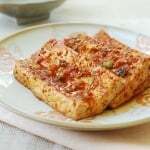 Heat a tablespoon of oil in a large non-stick skillet, carefully add the tofu pieces (tofu breaks easily) and sear over medium to medium high heat until lightly golden brown (about 3 - 4 minutes each side). Meanwhile, prepare the sauce by mixing all ingredients together. Spoon the sauce over the tofu pieces. Slightly lift a side of the tofu pieces to get the sauce under them. Simmer for 3 - 4 minutes over medium low heat. Flip them over and simmer for another minute or two. Serve warm or cold with a bowl of rice. For dinner tonight with fish n salad. It is really good. Braising makes all the flavors get soaked into the tofu pieces. It’s even better the next day. Hope you like it! I love this to sit overnight and eat it cold. And I also like to save some of the sauce to spoon over the cooked tofu rather than using it all in the pan. Keeps things a little more moist. 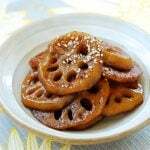 I love this dish, I just had it along with some spicy cucumber and radish salad side dish along with rice. Will definitely make this again. Thanks for sharing this recipe with us. I am glad to hear you liked it. Thanks and Happy New Year! 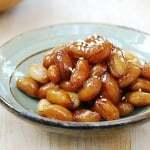 i love korean foods,and this one is my favorite. I just made this and it is delicious!! I only wish that it were about 4-5 levels spicier. Maybe I will add hot chili peppers next time. That would work. Or double the gochugaru. Thanks! 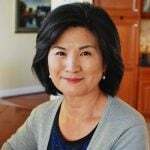 I’d like to as if there is any different betwwen Korean soy sauce and normal soy sauce, say, Maggi or Kikoman soy sauce?Which type of soy sauce you use in this recipe and in general? 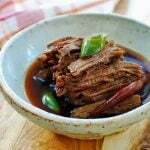 I usually use Korean soy sauce is very similar to Kikoman. I usually use Sempio – Korean brand, but sometimes use Kikoman if on sale. I haven’t used Maggi. Thank you so much for using my recipe! Our family had a special guest coming to town and his ultimate favorite is tofu. I was searching for a recipe to use and found your site. It was an absolute hit! Thanks for the great recipe post. That’s great to hear! Thanks for letting me know. Cheers! That’s great! I’m happy to hear your list is growing. 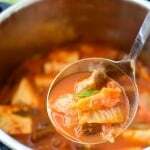 Kimchi jjigae and dubu jorim – sounds delicious! Happy cooking! Glad to hear you enjoyed it. Thanks for letting me know! This was easy to make and it came out great. I didn’t have red pepper flakes so I whisked in some gochujang instead. I didn’t have gochugaru so I used gochujang instead in the sauce. I hope it tastes the same. So far, it smells amazing! Thank you for the recipe! Hi, I usually only have time on the weekends to make food for the week. Do you know how long these will stay good for in the fridge? Thank you! It will be fine for 4 to 5 days. Enjoy! I just made this tonight and it was delicious! I’m looking forward to trying more of your recipes. Thank you! Great! Thank you so much for letting me know. Hope you find many more recipes your love.